The Dial is similar to a traditional dial knob that is found on devices such as stereos or industrial equipment. It allows the user to specify a value within a range. Like CircularGauge, Dial can display tickmarks to give an indication of the current value. When a suitable stepSize is combined with tickmarkStepSize, the dial "snaps" to each tickmark. 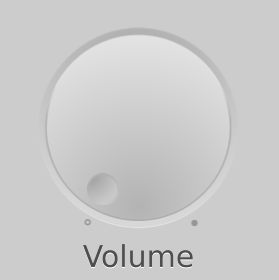 You can create a custom appearance for a Dial by assigning a DialStyle. This property specifies whether the dial should gain active focus when pressed. This property holds whether the button is being hovered. The largest value allowed by the dial. See also value and minimumValue. The smallest value allowed by the dial. See also value and maximumValue. Returns true if the dial is pressed. This property determines whether or not the dial displays tickmarks, minor tickmarks, and labels. The angle of the handle along the dial, in the range of 0.0 to 1.0.